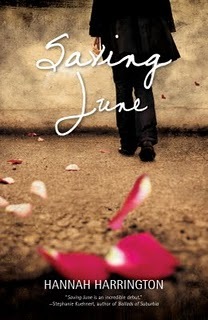 Harper Scott’s older sister has always been the perfect one so when June takes her own life a week before her high school graduation, sixteen-year-old Harper is devastated. Everyone’s sorry, but no one can explain why. When her divorcing parents decide to split her sister’s ashes into his-and-her urns, Harper takes matters into her own hands. She’ll steal the ashes and drive cross-country with her best friend, Laney, to the one place June always dreamed of going California. Enter Jake Tolan. He’s a boy with a bad attitude, a classic-rock obsession and nothing in common with Harper’s sister. But Jake had a connection with June, and when he insists on joining them, Harper’s just desperate enough to let him. With his alternately charming and infuriating demeanour and his belief that music can see you through anything, he might be exactly what she needs. Except June wasn’t the only one hiding something. Jake’s keeping a secret that has the power to turn Harper’s life upside down again. I got this book for review from NetGalley and I loved it. It was such a fun read, because I just love reading about road trips! They are so much fun! Especially when there is a little bit of romance in it. There was a bit of everything in this book. At first, i felt sad because of the death of the protagonist's, Harper's sister June. Later on in the story it became funny when she met Jake. Then Crazy and exciting when they went on the road trip. You just never get bored of reading. Every chapter, something new happens, therefore you're never bored reading this book. On to the characters. Harper was OK. I'm not a fan of her, but I also don't hate her. I just felt like she is too rough with her constant swearing and smoking. However what I do like about her is her strong personality. I hate girls who act all girly like they are dependent and always need someone to comfort them . She is a very strong character, who can cope on her own. that was very admiring. Jake, oh Jake! I adore boys who are different, so he was pretty high on my awesome list. I especially love his hair, and his personality. He isn't mainstream, someone who listen to the same mainstream music, have same boring interests, etc. He was different, which makes him unique and unpredictable for me.What I also liked about this book is the relationship between Harper and Laney, who is her best friend. I liked how they never fought and that Laney was very considerate towards Harper, considering her sister's death. I enjoyed reading this book very much. It was fun, enjoyable, heartwarming, and touching. I would totally recommend it to anyone who enjoys books like these :) Go ahead and give it a try, you won't regret it! I enjoy reading books about road trips too! There's just something about them, maybe it's the fact that I want to go on a totally awesome road trip of my own someday =) Anyway, have you read Amy & Rogers Epic Detour? I enjoyed that one. Wgar a great review ! I got this book from NetGalley and was debating reviewing/reading it. Now, I think I will. As for the question you asked about pre-order prices-- I was charged the price of the book on the day I pre-ordered it. Road trips are so fun and I love books about road trips! I do really need to get this book read! It looks great! Yes i agree! Reading about Road trips can be sooo much fun!! Hope you enjoy reading it! I'm really looking forward to this. It sounds like a really fun read! Haha, I actually just re-read this book a couple days ago and upped the rating I previously gave it on Goodreads. The second time around was even better than the first!